At dawntime on Saturday, 14 July 2018, Israeli military aircraft launched about 40 airstrikes on different parts in the Gaza Strip. Israeli warplanes launched about 85 missiles on security sites, residential areas, and empty fields. Artillery shells were fired in several areas east of the Gaza Strip. In these attacks, two children were killed and 28 were wounded, including two other children and a woman. The attacks spread fear and panic among the population. 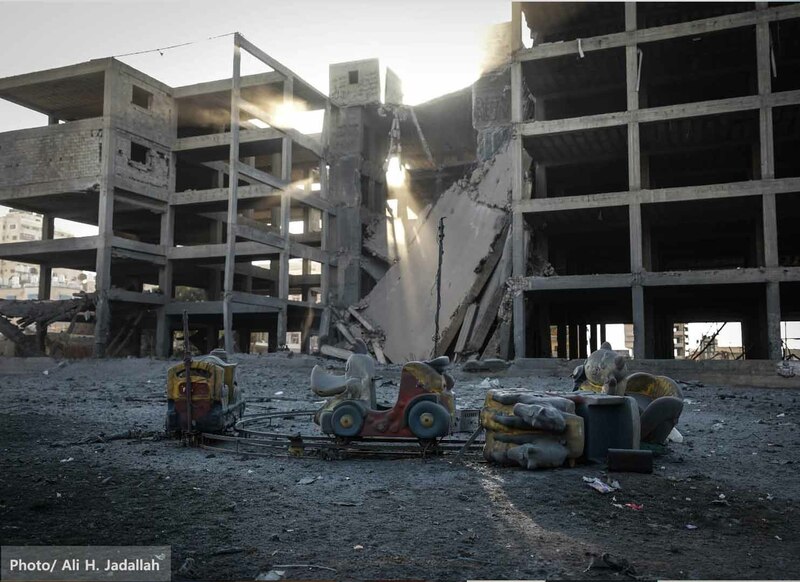 Al Mezan’s documentation shows that at 5:55pm on Saturday, 14 July 2018, Israeli warplanes attacked with five missiles the uninhabited Al Kateeba Building in west Gaza City. The attack was launched while two children were playing on the roof of the five-story Building. Both were killed: Loay Kuhail, 14, and his friend Amir Al Nimra, 14. A few minutes later, warplanes attacked the same building again with four more heavy missiles, causing part of it to collapse. 23 persons who were nearby were injured. Also, these attacks caused substantial damage to public facilities in the vicinity of the targeted building, including the Al Kateeba detention center and an office of the Ministry of Health where a number of the Ministry’s cars and ambulances were also damaged. Other properties, including NGO offices, markets, and houses, sustained considerable damages in this attack. Al Kateeba Building is located in a populated part of Gaza City. Surrounding it are offices of governmental agencies, non-governmental organizations, academic institutions, a public transportation station, and a public park frequented by families. At 3:30pm on the same day, Israeli artillery attacked with three shells lands in east Al Qarara town in east Khan Younis district. One of these shells hit a house and resulted in injuring of Ali Al Zir, 59-year old owner of the house, and of his wife. Doctors said both casualties were moderate. The one-story house of a tinplate-and-concrete-cemented roof was partially damaged. 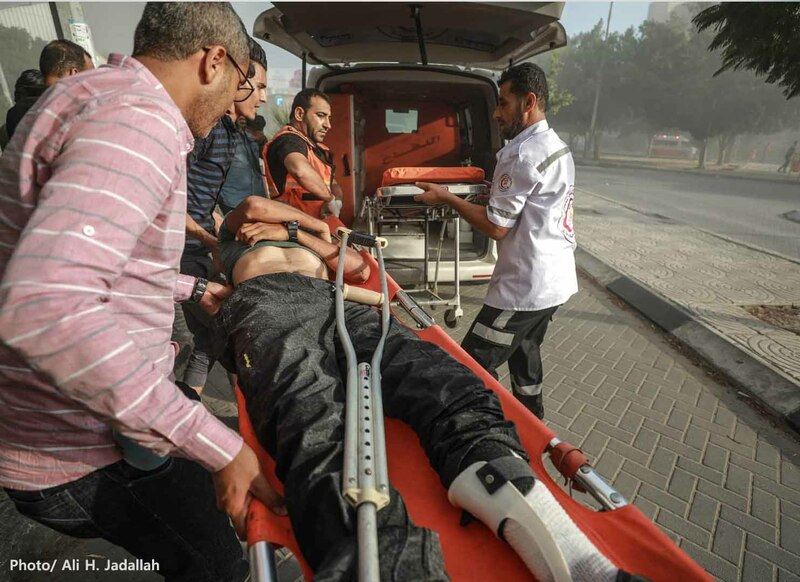 At 1:15am on Sunday, 15 July 2018, Israeli warplanes fired two rockets near a group of people in east Al Tuffah neighborhood in east Gaza City. One person was moderately injured. 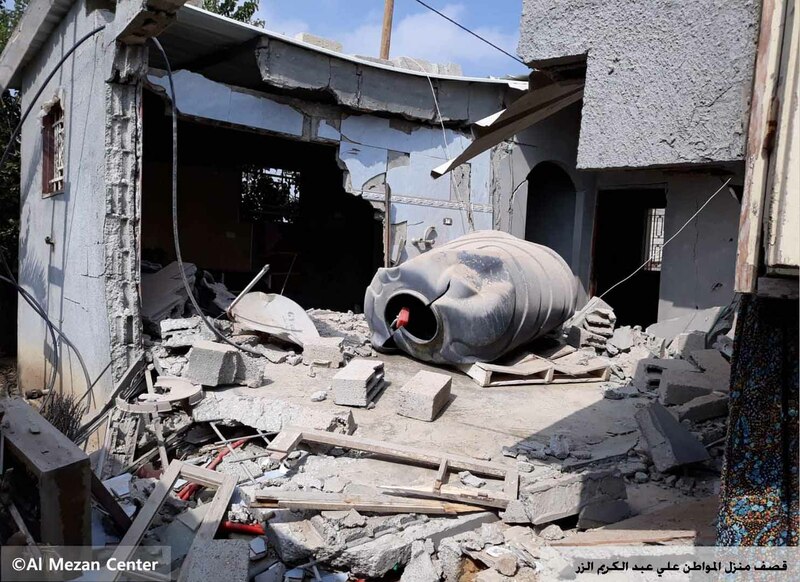 One of the two rockets was fired into the house of Majed Sukkar, 55-year old resident of Al Tuffah, whose son was moderately injured. Partial damage was further caused to the four-story, concrete-roofed house. Al Mezan condemns the military escalation and the targeting of civilian property killing and hurting civilians, including children. Alarmed by the public feelings of fear among people in Gaza, Al Mezan warns against any further military escalation that may turn into a new operation in Gaza. Given Israeli forces’ record of attacks against of civilians and civilian objects in the Gaza Strip, such a scenario would only compound humanitarian suffering in Gaza and would involve a priceless toll of human lives. Al Mezan urges the international community, led by parties to the Fourth Geneva Convention, to take steps as prompt and effective as possible to seek an end to military escalation in Gaza. The protection of Palestinian civilians is a legal obligation of these parties and, now, a test to the authenticity of their moral standards and humanitarian objectives, which strictly require that in times of hostilities that civilians and civilian objects be evaded attack and harm. Al Mezan stresses its position that failure to hold to account perpetuators of human rights and international humanitarian law violations has only advanced impunity. Al Mezan therefore calls on the international community to activate tools of accountability to ensure that violators are brought to justice, in accordance with the provisions of the international humanitarian law.